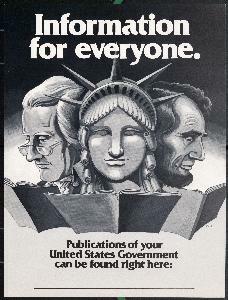 The U.S. Government Posters Collection consists of a variety of informational and artistic posters produced by government agencies and printed by the Government Printing Office. These posters are interesting examples of graphic design, and also provide insight into what the government has considered important in its work and policies. The majority of the posters date from the late twentieth century. Agencies represented include the Department of Agriculture, Census Bureau, Department of Defense, Department of Health and Human Services, National Park Service, Department of Labor, National Aeronautical and Space Administration (NASA), and others.